The PTA has a few introductions and some reminders as we all head into summer. First the introductions: We have two newly elected PTA co-presidents, Paul Radvany, parent of both a rising 9th grader and 11th grader, as well as an HCHS alumnus himself; and Michele Weisman, parent of a rising 8th grader and a daughter who graduated from HCHS in 2012. The full roster of 2015-16 PTA board plus PTA committee chairs and executive grade representatives is located here. Seventh & 8th grade travel class reps will be confirmed later this summer after travel classes for those grades are formed. If you are a 2020 or 2021 parent and wish to be on tap to serve as a travel class rep, please let Paul and Michele know at president@hunterpta.org. For more on Paul and Michele, and to see what you should expect from the PTA in August as well as a snapshot of important 2015-2016 school year dates, read on. More on Paul and Michele: Paul is a professor at Fordham University and serves as a mediator. He has served as a grade representative, an assistant legal counsel, and -- most recently -- as a PTA co-president. This past year, Michele served as the executive grade rep for 7th grade. Michele art directs and designs publications for children. In addition, she created and runs a Meet the Writer program at a public school in the Bronx. A LOOK AHEAD: In early August, HCHS parents will receive an email with PTA reminders for the start of school. This will be followed by our usual late-August PTA postal mailing containing the printed wall calendar, the school photo order form, a flyer about our upcoming TEDx HunterCCX conference in October, and information about fall PTA activities. You will also receive a separate August postal mailing from the school, containing orientation details, sports forms and other HCHS info. 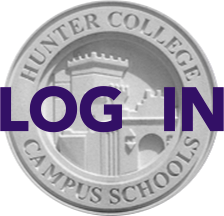 UPDATE YOUR DIRECTORY INFO: It is important that you update the online directory with any changes in your contact information over the summer and throughout your time at Hunter. Please remember that the PTA uses this data to send important notices throughout the year and it is how other parents see your information. You can update your record any time at www.hunterpta.org by logging in and clicking on Directory>Online Directory and selecting Option 3.